MB Post - A Social House. More Turf Than Surf. Bringing Gastropub to the Beach. Manhattan Beach, CA. Kinda like a Woodie but without wheels. 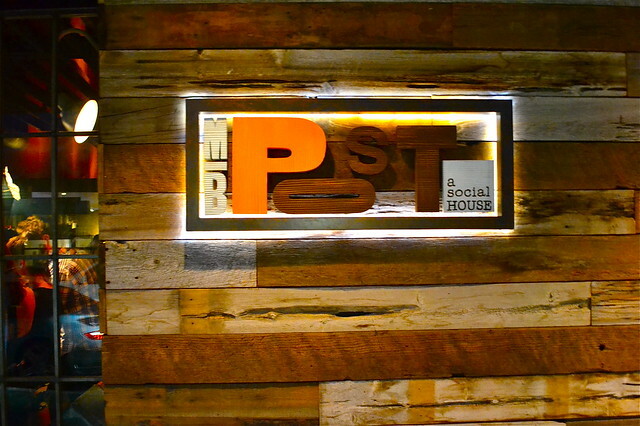 MB Post Social House in Manhattan Beach delivers. You can call Chef David LeFevre "The Mailman". And, my mouth is the mailbox waiting to be stuffed with good food. Yes, I can go with this whole postal theme all day long which is precisely what the crew behind MB Post has done because the building from where the current tenant operates used to be the local post office, — especially evident with the work of award-winning architect Stephen Francis Jones of SFJones Architects. All around the vaulted ceiling dining room are postal relics of rusty residential mailboxes. Looking for hand towels in the bathroom? Check inside the wall mounted mailbox and there you'll find them. Cozy, laid back and naturalistic (a refreshing change from the nightclub artificiality of its former resident Memphis at the Beach), MB Post is a grown up version of the neighborhood beach hangout without sacrificing the fun and beautiful people. Beyond its California beach good looks and lifestyle, MB Post brings with it the culinary pedigree of one David LeFevre (formerly kitchen QB of the stalwart Downtown LA seafood haven Water Grill) and the cocktail shenanigans of General Manager Jerry Garbus, Beau du Bois, Sal Roses and Greg Westcott. Although there is a whole lot of serious skill, kitchen and bar combined, nobody is taking himself too seriously. With menu categories like "A Lil' Sumin' Sumin'" and "Seafood...Eat Food..." plus deftly constructed cocktails named (while intoxicated no doubt) "Mo-Pho-Jito", "Festering Borough" and "Day of the Dead", the chains of all those years in formal kitchens and dining rooms can be heard clanking their way into the gurgling Pacific. 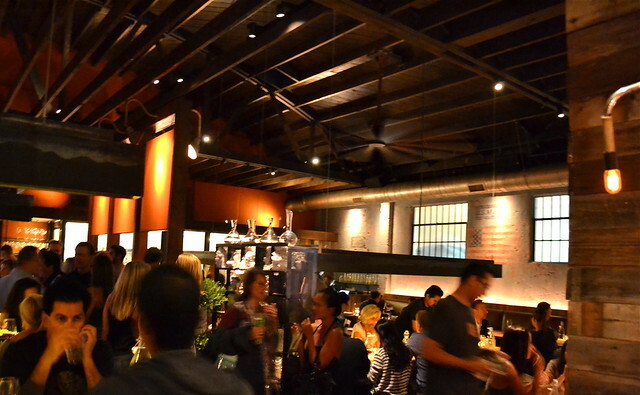 Clearly more gastropub than seafood restaurant, MB Post is Chef LeFevre's playground. He's honed his talents from his stints at the myriad of the top echelon establishments (Tetsuya, Fat Duck, elBulli) all across the globe and decided, with his new spot, he's gonna lighten things up. 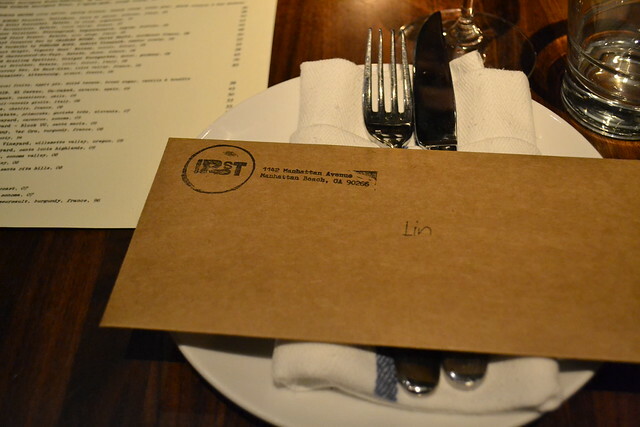 Keeping with the theme, the menu arrived to the table in a heavy stock envelope with the day's offerings tucked inside, both typed and scribbled onto the legal sized sheet. Looking around the well-lubricated room of festive locals, my dinner buddy Val and I needed an express delivery of booze and ordered the irresistibly named "Mo-Pho-Jito" and, obviously, when in Manhattan Beach, the "Manhattan Avenue" — MB Post's spin on the classic Manhattan cocktail. The "Mo-Pho-Jito" played off both the homeboy pet name as well as the ubiquitous Vietnamese beef noodle soup. 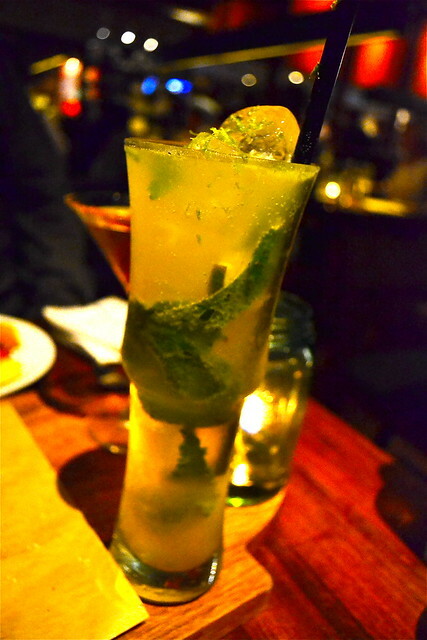 The drink's Starr African Rum, kaffir lime, mint, ginger, coriander and honey ultimately mingled to taste pretty much like a standard mojito with occasional bursts of ginger. MB Post's signature bevvy, the "Manhattan Avenue", has a lot going on: Sazerac rye whiskey, sweet vermouth, caramel, vanilla bitters with the glass rimmed with bacon dust. 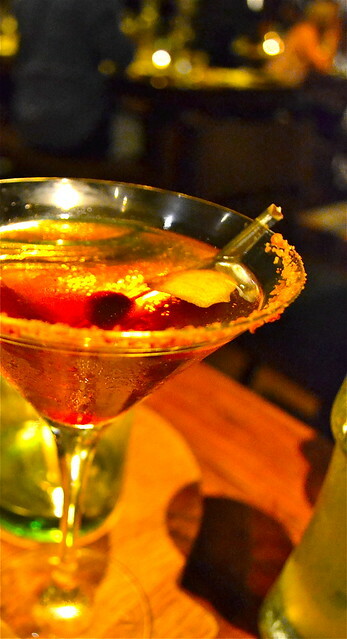 It's also embellished with a Scotch-soaked cherry and flamed orange peel. Mostly sweet and thick on the tongue, it smoothed out after a sip or two. Although the bacon element was a nice touch, any trace of it was pummeled by the other ingredients. 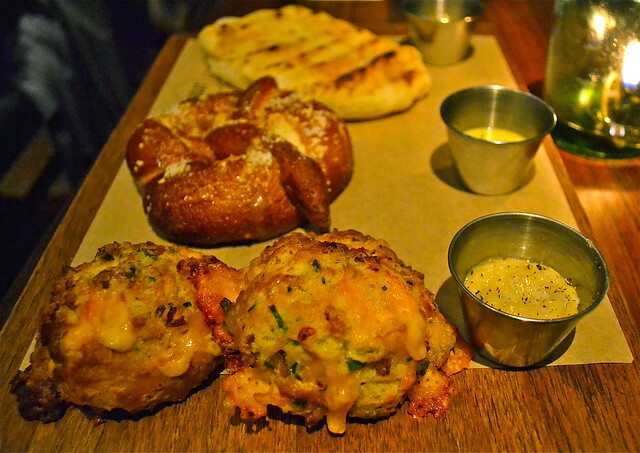 From back to front: Grilled Naan Flatbread, Fleur De Sel Pretzel and Bacon Cheddar Buttermilk Biscuits. MB Post, please stop "sexting" dirty pix like this! The bacon, however, would not be denied and shone brightly in its next appearance as MB Post's best bread item — the "Bacon Cheddar Buttermilk Biscuits with maple butter". Don't waste your time with the rest of the breads when sweet, buttery, cheesy, bacon bacchanalia lustfully calls your name. Order them as soon as your rump hits the seat because these beauties sell out every night. Smear the creamy, toothsome maple butter within its fluffy internals, then take a bite of the crusty, crumbly exterior and you too will be enslaved to the crack that is MB Post's bacon biscuit. 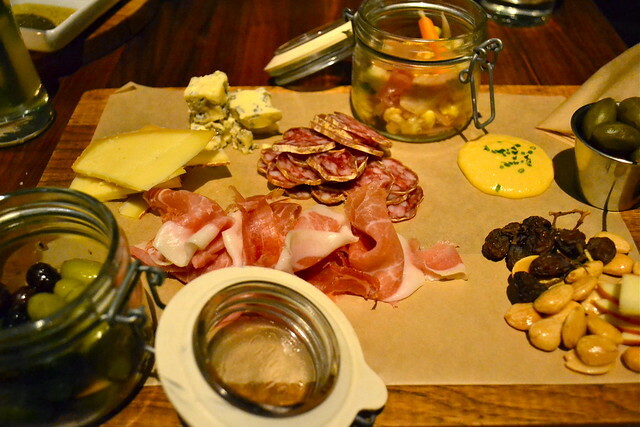 The charcuterie platter with selections of cured meats and cheeses was pleasant (though none of the items are produced in-house, some will be soon). The two absolute standouts were the La Quercia Organic Prosciutto, with its satisfying chewy texture and perfectly salty flavor, as well as the Mycella Blue, "2010 World Cheese Championship Contest" winner in the blue cheese category — if you love blue cheese, this combination of velvety texture, unique pungency and satisfying saltiness makes it a world champ, for sure. I love a good gazpacho. Lucky for me, Chef LeFevre decided to debut his version of the classic Spanish cold soup that night. 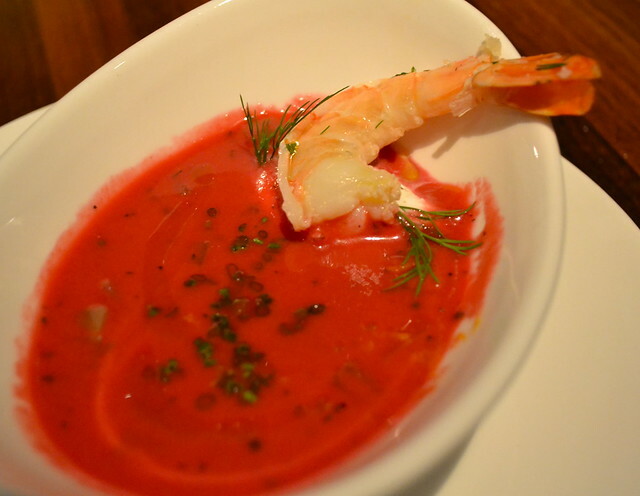 MB Post's "Tomato & Beet Gazpacho w/ Horseradish Cream and Mexican Shrimp" was an invigorating and silky vegetable beverage with the bright hues of the tomato and beet making it almost glow with flavors. The snappy shrimp brought a contrast in texture along with its protein. Biting back was the zip of horseradish cream, while rounding out the seasonings were the sprigs of dill and finely chopped chives. As a reward for finishing your veggies, the final layer of the soup was diminutive bits of blanched and veined celery that punctuated this superb gazpacho with a satisfying crunch. 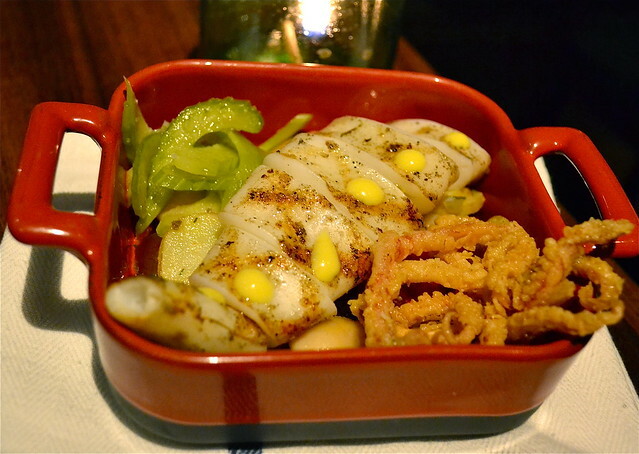 Seafood is Chef LeFevre's claim to culinary fame, so it's no surprise that he excels at cooking stuff like squid. Grilled perfectly with pretty char marks and all, the "White Oak Grilled Sword Squid" is served from tentacles to tail (do squid have tails? ), with the tentacles battered and fried and the body grilled and sliced. The grilled portion is very texturally appealing, joyously tender with a bit of snap; I'm happy that Chef LeFevre didn't batter and fry this part of the squid. Dressed with lemon curd, it's delicious in its simplicity. 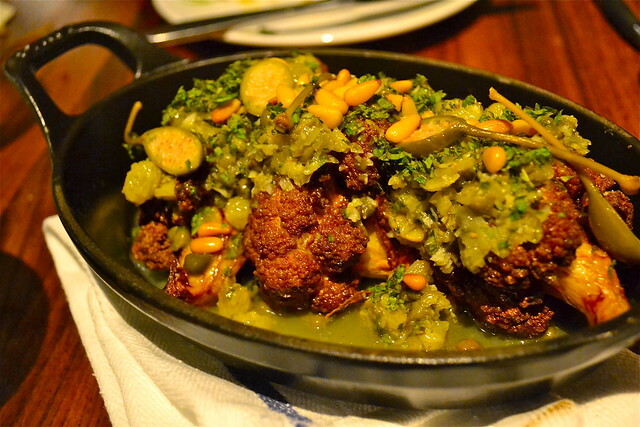 I can't even recall the last time I ate cauliflower in a restaurant. Oh, wait, yes I can. And it was not a good experience. However, I never let one bad experience keep me from giving cauliflower another chance. MB Post's "Yellow Cauliflower" was more like a brown cauliflower. It's smothered in macerated sultanas, chopped mint, halved caper berries and toasted pine nuts. Once cut into, the vibrant yellow of the cauliflower was then revealed and contrasted dramatically with its roasted, dark exterior, making for an interesting visual. Although firm, the vegetable yielded nicely and the quirky mélange of ingredients joined forces to create an earthy, smoky and citrus profiled serving of cauliflower. It was very unique and tasty. What is not to like about steamed mussels luxuriating in a green curry bath with "Vietnamese sausage" (aka Chinese sausage)? 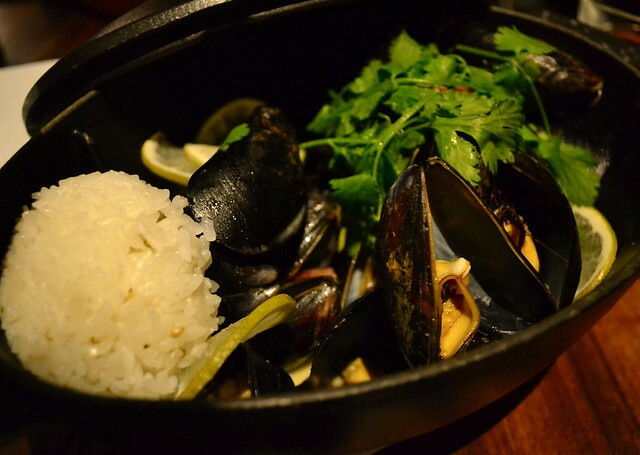 Served with a fluffy side of coriander rice, the order of "Steamed Mussels" successfully infused all the flavor of the sweet and the heat associated with Thai green curries. Drizzle the sauce onto the rice and the other tables without it will be green with curry envy. Good thing for them, the serving is so generous, it can likely serve a party of 3 to 4. The sweet "Vietnamese sausage" adds another level of flavor. I appreciate that this common Chinese cured meat is being introduced to diners who may have never tasted it before. Pork belly is getting to be like mac n' cheese or sliders on a bar menu. 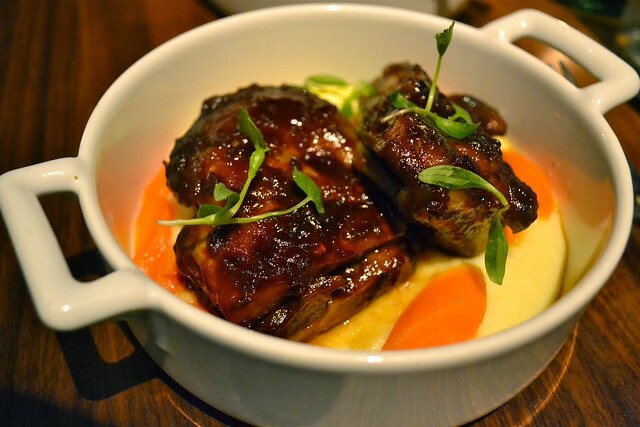 This is probably why Chef LeFevre opted to go bold and construct something with lamb belly. Much more difficult to cook than pork because of its natural gaminess and leaner flesh, LeFevre found it imperative to brine this unusual cut for 24 hours and then braise for another 48 hours. The result is extraordinarily tender lamb finished as a "Moroccan BBQ Lamb Belly". It's fork tender. Still fairly gamy, the sweet BBQ sauce managed to cut it a bit. I applaud the concept, unfortunately, I found my serving overly salty. The same joy and humor that the MB Post family finds in putting together the drink and entrée choices is also embedded into the dessert selections. Take the "Elvis". 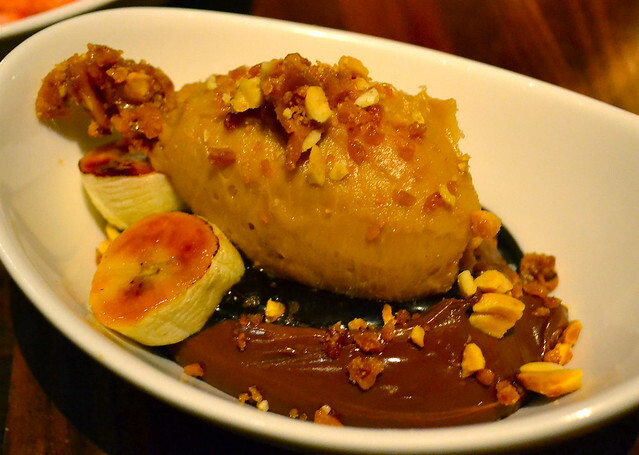 As stated on the menu, it's "a wonderful mess of peanut butter mousse, bacon brittle, caramelized banana + chocolate pudding." This is the real reason why Elvis is no longer in the building or among the living. You've never experienced a sugar rush until you've taken a bite of this confectionery beast. 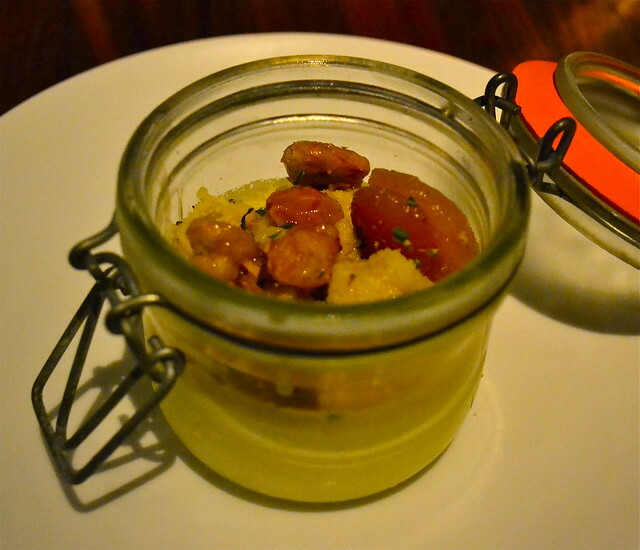 The "Lemon Ricotta Cheesecake" was a much more genteel dessert and playfully presented in a Mason jar. Its unique texture — essentially creamier and runnier near the jar's top then becoming more solid and familiar as cheesecake near the bottom — took a little getting used to, but, when combined with the other elements of stewed apricots, cornmeal streusel and marcona almonds, it was a sweet ending to a creative, fun and flavorful feast. To paraphrase the old post office pledge, neither rain, nor snow, nor sleet, nor hail shall keep the MB Postmen (and women) from their appointed rounds. Which reminds me, it's time for another Manhattan Ave.
omg omg omg omg. SO wonderfully wrong on SO many levels. I was all excited that I have some pesto in my fridge, now it seems a little ant-climactic. Dagney, there is no pesto that can match MB Post's bacon biscuit! Pesto will submit to bacon biscuit! Thanx for reading! 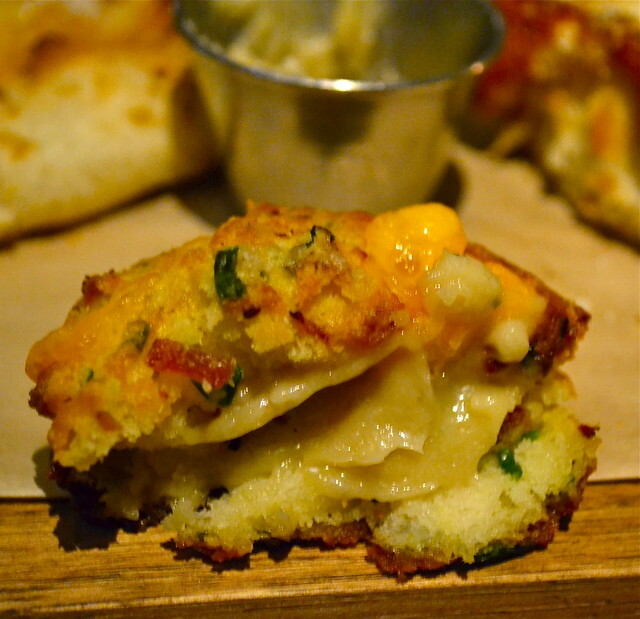 Hey StuffyCheaks, those biscuits look amazing and taste amazinger! 5 bux an order and totally worth it!